I am supporting vendor based application, which is filled with blocking and deadlock. Deadlocks occur mostly involving two or three processes however I noticed yesterday, it was involving 9 SPIDs. Can somebody please help me in understanding this deadlock graph and solution on how to avoid this. Isolation level is set as Read Committed Snapshot. 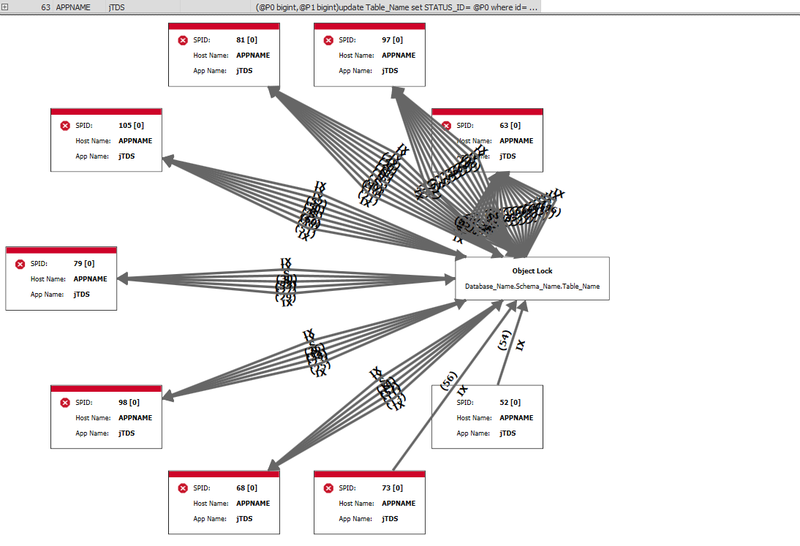 When I opened this deadlock graph in Sentry One plan Explorer, it was scary. Transactions blocking eachother, with lock escalation under the repeatable read isolation level can cause blocking and as a byproduct of blocking, deadlocks. Whereas the requestType="convert" explains that the processes are trying to convert the shared lock into an IX lock. In Repeatable Read the object-level S locks that conflict with the pending IX locks could have been acquired on an earlier query in the transaction. Meaning that a reasonable explanation is that all these transactions are trying to convert their own shared lock (e.g. because of a previous select) into an Exclusive lock (Update statement). As a result of being in the repeatable read isolation level they do not want to give up their locks, resulting in deadlocks. You should contact the application team / vendor and see if this a necessary evil, because blocking will be more prevalent. Next to checking up on the isolation level, you should look into speeding up the queries inside the transactions by adding indexes. This morning managed to get vendor to change the setting of isolation level from Repeatable Read to Read Committed and in last 6 hours not even a single deadlock is encountered. Earlier every hour we used to have more than 5-6 deadlocks in working hour. Thanks a lot for your help, this was great answer. Disabling Implicit transaction seems to be not feasible at this point as vendor needs to do code change. @Learning_DBAdmin Great to hear! Happy to help, thanks for your kind words! 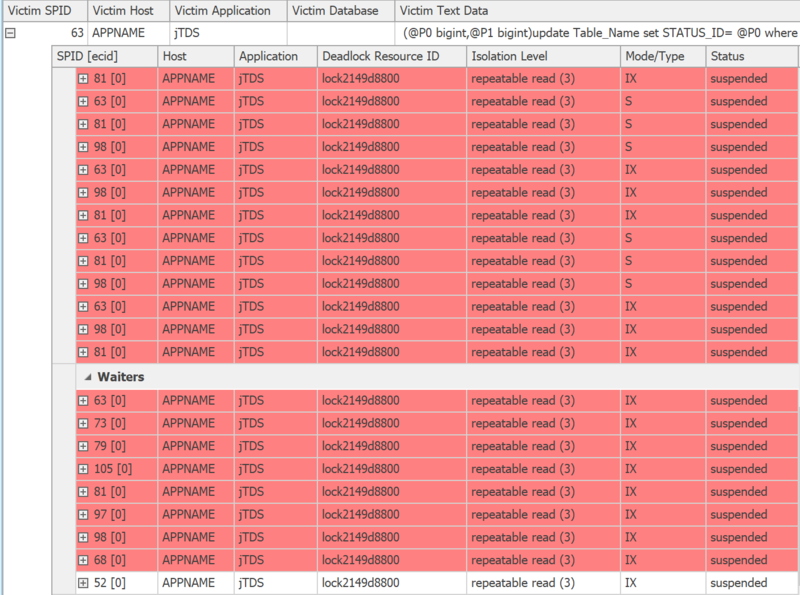 This definitely seems to be a bad combination of isolation level, lock escalation, and many sessions each issuing multiple queries inside the same transaction. If you replay the deadlock you will see all of these different sessions holding their transactions open for relatively long periods of time (5+ minutes, which is crazy, though the animation really hides that), and issuing multiple queries intermittently. You need to drastically reduce the amount of time you spend inside those transactions (or get rid of them altogether), collapse multiple queries for different parameter values into a single, point-in-time query, build better indexes so that escalation doesn't happen, stop forcing repeatable read, created a clustered index (if I'm reading the resource descriptor right, that's a heap!? ), or all of the above. This can also lead to blocking if the application doesn't explicitly close transactions. This can be set at the connection level, or by calling SET IMPLICIT TRANSACTIONS ON explicitly. You have transactions that started at 15:25:26 that are still running at 15:30:58. Five minutes is usually way too long to be holding locks - it's a recipe for blocking and deadlocks. This seems like potentially an accidental open lingering transaction. If you have any control over the application's connection string, verify that they are not turning this setting on. Also, double check that this isn't set at the server level via sp_configure 'user options (see here for more detail). 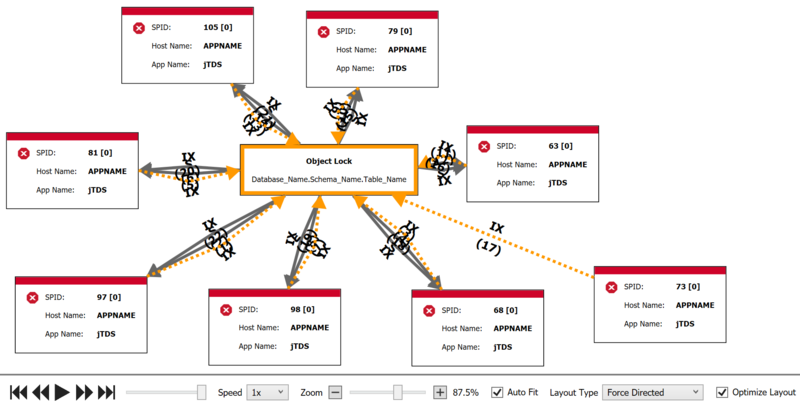 [SOLVED] Why isn't the objectname and indexname populated in deadlock graph? [SOLVED] How do I understand this DeadLock Graph? [SOLVED] Why are there Victimless Entries on the Deadlock Graph? [SOLVED] SQL Server Deadlock Graph - Table, Page or Row Lock?